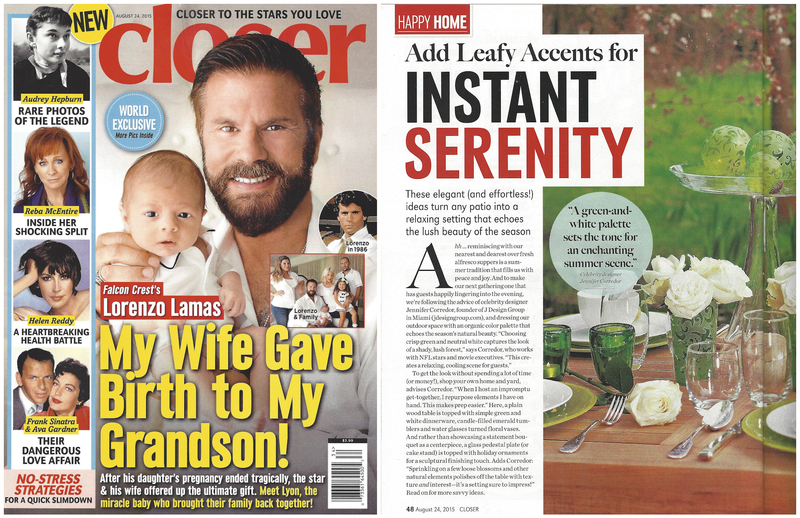 Congratulations to our ClientÂ J Design Group for their feature in Closer Weekly! Celebrity designer and founder of J Design Group, Jennifer Corredor, provides sage advice to Closer Weekly for turning your outdoor patio into a lush setting. Corredor, who works with NFL stars and movie executives, suggests choosing crisp green and neutral white to capture the look of a shady, lush forest. This creates a relaxing, cooling scene for guests. Create the look with a wood table, simple green and white dinnerware, candle-filled emerald green tumblers and water glasses turned flower vases. Whether it is prestigious office, luxury home, casual cafe or anÂ upscale restaurant, J Design Group’sÂ team of interior decorators are equally at ease to carry out any type of project from initial planning to final implementation. Check them out at jdesigngroup.com!